Kenneth Polderdyke was a loving husband, father, and friend to many. His incredible integrity and high level of competition were woven throughout a lifetime of hard work and dedication given to any task or challenge set before him. He was always one to strive for excellence in every aspect of his life. His humor, his laughter, and his compassion for others will be his legacy. Kenneth leaves behind a rich collection of memories for his special friends and family to cherish forever. On February 15, 1929, George and Selma (Fenwick) Polderdyke welcomed home their newborn son, Kenneth, in Vicksburg, Michigan. Growing up with a set of hardworking parents, Ken valued making an honest living from a young age. With a long history of farming in the family background, Ken enjoyed countless hours tending to team horses and managing their every need. 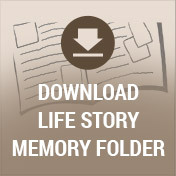 His father later went on to become an electrical contractor and shared much of his knowledge with Ken over the years. Ken lived a typical childhood of the times when warm summer days included picking huckleberries in the swamp at his grandparents’ farm and playing baseball with neighborhood kids. He attended Kalamazoo Central High School playing both football and baseball during his years there. After graduation, he continued working at his father’s electrical business soaking in the tricks and the trade of self-employment. Earning his own license as an electrician, he eventually opened his own business, Polderdyke Electric, Inc., making a life of managing commercial projects for growing businesses including Jim Gilmore Enterprises, the Gilmore Car Museum, Gilmore’s Department Store, and Kalsec. Ken was highly respected for his professionalism, generosity, and quality service developing a long standing and loyal customer base during his career. Ken was equally successful in romance. He met his wife, Viola, in the basement of Gilmore’s Department Store (also known as “the Bargain Basement” at the time) when he was working on a job and she was working in the gift wrap department. It was a lifetime family joke that he found Vi in the Bargain Basement. He was the tender age of seventeen and she was nineteen, yet they didn’t let age determine their fate together. On their first date, she told Ken to pick her up at the house near the fire hydrant and little did he know there were three fire hydrants on her street! During these early dating years, Ken boxed with the Michigan Golden Gloves Association. He had quite an impressive winning streak, but chose to hang up his gloves when he broke his nose! His mother never knew of his local stardom in the ring until one morning she unfolded the paper to a picture of him and was not pleased. Ken and Vi enjoyed taking in movies together as well as sliding at Campbell Lake until shy Ken worked up the courage to propose! 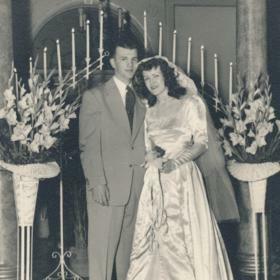 Joining in marriage on March 5, 1948, at the Kalamazoo Civic Auditorium, they were eager to start their lives together. Fitting for such lovebirds, their first home was on Lovers Lane. 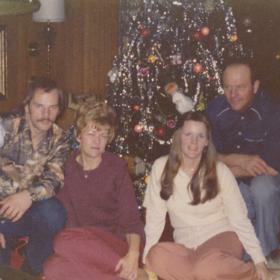 They later moved to their home on B Avenue in Otsego, where they raised their children, Kevin and Candace. 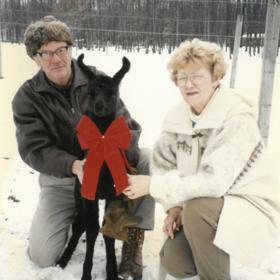 Ken and Vi lived there for over forty years, before moving to their current home in Oshtemo. As a father, Ken treasured his years of raising his children. He coached Little League in the Otsego community, enjoyed playing badminton with the family in the backyard, and he taught Kevin his business. The family enjoyed many wonderful trips together including a month-long trip out west to many of the national parks including the Grand Canyon and stops at the San Diego Zoo and Disneyland. He once unknowingly left Vi behind when she stepped out of the camper for a minute and he took off without her! Always a practical joker, yet this time it was a sincere mistake! They also enjoyed many Tiger baseball seasons through the ‘60s, even traveling south to Florida to attend their spring training games. Kevin still savors his autographed baseball from the Tigers versus Yankees game there. Ken and Kevin also took many father and son adventure trips together. They traveled to Ontario and western Canada where they hunted and fished. He instilled in both of his children the value of a strong work ethic, paying cash for things, as well as a deep respect for nature. Retirement afforded he and Vi the opportunity to continue on with their favorite traditions and pastimes. Known to play cards as well as bowl on leagues over the years, they became hobby farmers during these later years together. Vi spotted a picture of a llama on a billboard on one of their trips and before they knew it, they were at an animal show purchasing their very own! Dabbling in raising livestock, they eventually owned thirty llamas and alpacas as well. Ken fulfilled his dream of purchasing property in the Upper Peninsula and building a cabin where he shared many of his fondest memories. He spent many trips up there with Kevin or close friends who enjoyed smelt dipping or snowmobiling. The cabin offered him a retreat away to enjoy the peacefulness of nature. More recently, Ken was content to tend to his llamas and alpacas and to feed and watch the birds near their home. As much as Ken was modest and quiet, he was equally a prankster. No one ever knew what joke he was going to pull next as he would often distract others in order to move something and watch their reaction! He was known to wrap Christmas gifts that could include a muskrat’s tail! Ken loved a good hearty laugh and never went a day without laughter! Other than his special beef steak, water cakes, and butterscotch pie for his birthday each year, he wanted nothing more than for his family and close friends to be happy. Described as exceptionally kind and extraordinarily modest over the years, Ken will surely be greatly missed by his loved ones. May they be touched by his gentle ways and loving spirit for many years to come. 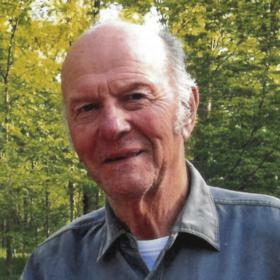 Kenneth Polderdyke, age 89, of Kalamazoo, Michigan died peacefully on January 25, 2019. 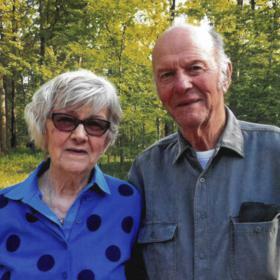 He will be greatly missed by his wonderful wife, Viola, of seventy years, and his two children: Kevin (Karen) Polderdyke and Candace Polderdyke. Cremation has taken place. Visit with family and friends on Wednesday, January 30th from 5 PM-7 PM at Betzler Life Story Funeral Home, 6080 Stadium Dr. Kalamazoo (269) 375-2900. Private family services will be held.  Please visit Kenneth’s personal web page at www.betzlerfuneralhome.com, where you can archive a favorite memory or photo and sign his online guestbook before coming to the funeral home. In lieu of flowers, memorial contributions may be made to a charity of the donor’s choice.